There’s something about live music that polished studio recordings can’t outdo. That is why I personally prefer the released live versions of Fra Lippo Lippi’s “Everytime I See You” and America’s “You Can Do Magic” over their proper recordings. Or it’s now difficult to dissociate the melody lines from the counterpoint in Freestyle’s take of “Bakit Ngayon Ka Lang” with Pops Fernandez. The intrinsic quality of live performances has bewitched Filipino music lovers that the concert scene is always alive. In music clubs, food and drinks go well with live bands. Some acts developed fan bases not necessarily because of radio hits or truly worth-listening recorded songs. They’re simply good playing live and spectators come back to re-experience organically loud and lively shows. 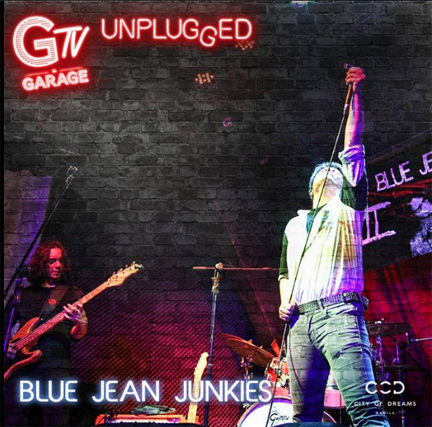 Blue Jean Junkies performing at the opening of GTV Unplugged at The Garage. Perhaps the thrill of seeing musicians deliver the goods warts and all right in front of you makes it a privilege delightfully embracing. That was partly the reason why The Beatles, at some point after doing a series of studio tricks-powered psychedelic albums, wanted to get back to their roots as live performers. The latter perception is what GTV Unplugged is doing to the City of Dreams Manila’s new attraction called The Garage, a VR zone and food park situated in a 2,714-square meter and air-conditioned space located at the upper ground floor and boasting modern industrial interiors catering to a 563-seating capacity. At no cover charge, GTV Unplugged, the weekend link between good food and cool virtual reality entertainment, features select local artists Blue Jean Junkies, Meleena, and Pancake 80’s every Friday and Saturday, from 9:00 p.m. to 12:00 midnight. The three acts mentioned are legit live spectacles, with Blue Jean Junkies, a rock ‘n roll band formed in 1999, already frequenting several hotels as well as major local and international events. The group will go on stage The Garage on Saturday (Nov. 24). Meleena is known for her playful yet soul-touching and intricate vocal techniques while the Pancake 80’s, scheduled to perform tomorrow (Nov. 23) and next Friday (Nov. 30), serenades the crowd with songs from different genres rendered in unique flair.